Gopala Ratnam Subramaniam Iyer perhaps knew somewhere at the back of his mind that the political saga he was about to embark on after the hugely successful BOMBAY, could be doomed for failure. What he perhaps never imagined was that he was about to create a cinematic masterpiece so brilliant and haunting, neither government, nor box-office could prevent it from engraving itself in the hearts and minds of Indian cinephiles. IRUVAR was bold, not just for it’s fictionalized exploration of the epic M.G. Ramachandran – M. Karunanidhi relationship, but for the cinematic trends Mani Ratnam chose to break, or as some may argue, return to. The 90s were the age of A.R. Rahman’s Muqabla and Humma Humma. Shankar had stormed into the scene with a string of commercial spectacles. Audiences preferred action and gimmickry to the more simplistic, script and character-oriented family dramas that dominated the earlier years. Technology had taken over the Kodambakkam film industry and filmmaking became an excuse to play with these new toys. Audiences didn’t seem to mind either, for to be awed and nothing less, they went to the movies. Star or not, every producer was making money. And then there was Mani sir. Neither Kollywood’s newly acquired toys, nor Rahman’s rhythms fascinated him anymore. At a time when theatres boasted of their gargantuan cinemascope screens, Ratnam stuck his middle finger up and shot his film in a classical 4:3 aspect ratio, unthinkable in an industry that has refused to even consider anything lesser than scope for decades. While other filmmakers flew to exotic, colourful, foreign locations to shoot their songs, Mani sir chose to stay home and shoot them in Black & White. Rahman’s synthesized sounds and loops were replaced with veenas and violins, thavils and timpanis, brasses and bass. In what was perhaps the riskiest of casting decisions, Ratnam cast a living legend to play a past one. Such is the brilliance of Mohanlal’s layered performance that minutes into the film, you forget the thespian’s persona and are sold on Anandan being MGR. 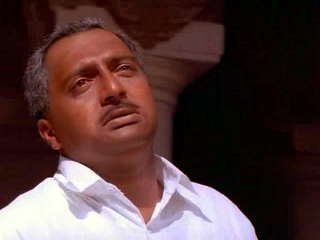 Equal to the task was the relative rookie Prakash Raj as Tamizhchelvan (M. Karunanidhi) who would go on to win the National Award for Best Supporting Actor for his career-defining performance. Prakash Raj was selected after talks with the initial choice, Nana Patekar failed, following rejection of the role by several thespians such as Mammootty, Kamal Haasan and Mithun Chakraborty. A magical ensemble surrounded this duo, each leaving behind a memorable presence regardless of screen time. Be it Revathy as Tamizhchelvan’s demure wife or Gauthami as the abused heroine seeking refuge at Anandan’s home, the detailing in their acts is impeccable. Lest we forget the mesmerising Tabu in her cameo as Tamizhchelvan’s lover, or Nasser commanding his scenes as Aiyya, the Anna Durai character. And yes, there was Aishwarya Rai too, making her feature film debut, impressive, yes, impressive, in a spunky double role. Ratnam plays out the political saga linearly, starting from Anandan’s days as a struggling actor to his chance meeting with Tamizhchelvan in a studio set that sets the foundation for a friendship that would change the very nature of politics in Tamil Nadu. Prakash Raj’s role may have been slotted in a Supporting Actor category, but let it not disguise the fact that IRUVAR narrates a parallel story of two men, not just a sole protagonist. Ratnam chronicles Anandan and Tamizhchelvan’s rise in cinema and politics respectively through the first act, laying the seeds for a meeting of political ideology and influence. Tamizhchelvan writes politically and nationalistically charged lines which Anandan heroically performs on screen, sending Tamil Nadu’s cinema-mad public into frenzy. Anandan is the face of the fervor, his fans willing to dance to his every tune, yet he doesn’t know it. Tamizhchelvan spots a man capable of defining history and in what is perhaps one of the film’s most exhilarating scenes, strips Anandan off all his innocence, giving him his first raw taste of power. Anandan tastes power for the first time. Yet, Tamizhchelvan fears for the corruption of politics by cinema, opposing the party’s decision to recruit Anandan as a member. The stage is set for a brewing ideological clash between two best friends, held together by one man, Aiyya (Anna Durai). In one of the most telling scenes of the film, Ramani reminds Anandan that he is late for a political rally, only to realize he already knows it. Anandan takes Kalpana (based on Jayalalithaa) along for the ride, strategically making his entrance at the rally in the middle of Tamizhchelvan’s speech, just to test his power. When Tamizhchelvan denies him a ministry position, Anandan knows he has what he needs to fly solo. The epic battle scales heights Anandan and Tamizhchelvan perhaps never imagined it would. In the midst of it all, Ratnam fashions a scene of stupendous poignancy where the friends who have turned foes come face to face. The mastery of Mohanlal’s and Prakash Raj’s performance speaks volumes without any words about the war which has become bigger than them, escalated to a point of no return. While IRUVAR is a fictionalized account of the MGR-Karunanidhi tale, Ratnam doesn’t shy away from anecdotal references. Like MGR, Anandan is shown to have Keralite roots, he is accidentally shot by a reigning villain during a movie shoot, MGR’s move to provide every unemployed man with a cycle-rickshaw to earn a living is referenced in a song, even the oft-heard rumour of Jayalalithaa bearing an uncanny resemblance to MGR’s first wife is blatantly played out with the casting of Aishwarya Rai in a double role. And this very quality of the film was perhaps its undoing, for Ratnam failed to fictionalize his script enough to escape the wrath of political parties. The film was initially denied a censor certificate by a cowardly board that seemed more vested in the interests of references to politicians still in the game. 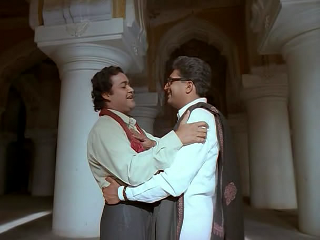 IRUVAR was eventually cleared by a special revision committee, with severe dialogue cuts, which Ratnam would mask with Rahman’s scintillating score, edited for dramatic impact. Despite the clearance, politicians threatened legal and physical action if “objectionable” portions on the Dravidian movement weren’t removed. Mani Ratnam did not relent, but eventually, exhibitors did. Was it political vendetta that forced them to do so, or a dumbed down audience more interested in the kind of political film where a man becomes Chief Minister for a day, jumps on buses and beats the living daylights out of goons, we may never know. What we do know is that IRUVAR, for its craft and Mani Ratnam’s fearlessness, is a landmark in Tamil cinema. Santosh Sivan’s majestic frames are studied by cinephiles all over India even today. Who needs cinemascope for a film to look epic? Ratnam and Sivan reinforced that the classical ratio still stood firm as the frame to capture the most expressive compositions. Sivan deservedly won the National Award for Best Cinematography for his work. Be it the previously cited scene of Anandan realizing his power or the one where he speaks on stage with the camera circling around during the speech, Sivan’s work blended the classical style of the early days with movements better known to the post-modern era. Yet, it is his use of natural light in static interior compositions and spectacular deep-focus photography, rarely ever seen in Indian films such as in the scenes below that exemplify his mastery. The scene Santosh Sivan fanboys swear by. Score takes over dialogues that censors killed. Equally significant is Suresh Urs’ editing which never allows a dull moment in a film clocking in at 2 hours and 38 minutes. The juxtaposition of shots is as meticulous as the shots themselves, allowing performances to play out, milking each for emotion to the maximum. The concept of “less is more” has never been exemplified better in Indian cinema editing, as Urs is never insecure about staying on shots without cutting away, as long as the shot itself is enhancing and diversifying the value of the scene. It remains a pity Urs’ edit was marred by censor cuts. 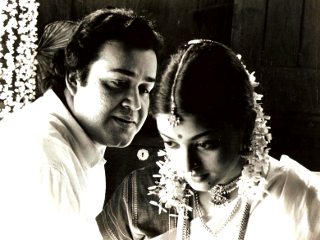 The recently deceased Art Director Samir Chanda often goes unmentioned in discussions on IRUVAR and inexplicably so. The detailing of the time period is dexterous and impeccable. From the movie sets that Anandan shoots in to the detailing of the exteriors, Chanda’s work is exemplary. IRUVAR sees Mani Ratnam speak a cinematic language that is perhaps still alien to a majority of the Tamil mainstream audience. Yet, he maintains a mainstream format of filmmaking, replete with lip-sync song interludes, which he uses craftily as part of his narrative. One of the most eye-popping of them is the politically charged “Udal mannukku, uyir thamizhukku” interlude, voiced by actor Arvind Swamy, shot in stunning Black & White, in angles and compositions reminiscent of a Kurosawa battle scene, which finishes with a rousing ovation at a local movie theatre. A.R. Rahman brings back the style of the 50’s and 60’s in much of the songs with nasally sung melodies, heavy use of the accordion and harmonica, and even a superlative exploration of jazz and the blues in Hello Mr. Ethirkatchi and Vennila Vennila respectively, the latter sung to utmost perfection by the amazing Asha Bhosle. It is often argued that at times the songs hamper IRUVAR’s flow, at one point, two of them literally popping up back to back. But the music and picturization are so wonderful, Ratnam makes it difficult for viewers to keep up their complaints. Fifteen years after IRUVAR’s release, or close to forty years since its setting, the film remains topical even today. The DMK-AIADMK rivalry in Tamil Nadu still prevails, the inseparable relationship between politics and cinema still plagues creativity, Tamil filmmakers still fear to tackle mature, political subjects, while the audience has moved towards patronizing a brand of cinema that couldn’t be farther away from what Ratnam attempted with this film. Yet, IRUVAR will live on, not just as Mani Ratnam’s greatest and boldest film till date, but also the only, albeit unofficial cinematic account of Tamil Nadu’s political history. As I conclude this recollection of my favourite Tamil film of all time, I’d like to showcase the excerpt below that exemplifies every aspect of IRUVAR’s craft, and ends with the film’s single-most memorable line. ← Some know him as God, you may call him Marty. A smashing debut here Vijay and you have just hit a monstrous six. Performances, Music, Cinemtaography you name it and every aspect here is the best in a long time. Would share more as i intend to re-watch it again this weekend and point more details. Thanks for making my day. I agree that IRUVAR is no. 1 on the Ratnam list, with NAYAKAN following a close 2nd. Many argue that Nayakan is his best work, but for all its brilliance, Nayakan still uses too many elements of The Godfather movies to tell its story. The construct of scenes and style in IRUVAR are far more original. Looking forward to your thoughts after you re-visit the film this weekend. I always thought kannathil muthamatilal has his first and bombay goes next. Ofcourse this is one of mani ratnam’s wonderfull movie ,i just can’t see this one as top of the list. A film on which I can write a book perhaps. you have done a nice job in writing about all the key aspects in such concise form. This is Maniratnam’s finest work. period. Attention to detail was amazing. Performances – superlative, with so many subtleties. Santosh Sivan shows us why he is a god of cinematography. The way he lit the frames, the crop factor used, the positioning of cameras, the fish-eye effects at certain points… amazing. even costumes were perfect. Notice how Prakash Raj’s transformation happens. he doesn’t sport any spectacles in the beginning, then spectacles keep changing, as age progresses. Same with Mohan Lal. He slowly turns bald and his agility is also taken care of. Mani first went to Ilaiyaraaja, for this movie’s score (probably because it is a period film and they have worked on Nayakan together). But when Ilaiyaraaja declined, Rahman was roped in and Rahman’s score(songs + BGM) was absolutely terrific. A score which rahman himself never surpassed again. Sameer Chanda was in top form again. editing too. Iruvar has a distinct grammar of story-telling. I am sure satyajit ray would have liked this film, had he lived long enough to watch this. Pity that actors like Mammooty and Kamal Haasan refused this film. Prakash Raj was wonderful anyway, but it would be have been amazing to watch Mohan Lal vs. Kamal Haasan. Iruvar is one of the textbooks for film-making, atleast for me. I can forgive Mani for a 100 Raavans because what he created in Iruvar, is a piece of art… with a fine craftsmanship that is rarely seen in indian cinema. The great Adoor Gopalakrishnan has repeatedly lauded Mani Ratnam for bringing out Mohanlal’s “best-ever performance” in this film. Iruvar..one of the best cinematic experience i had while watching this film. A film which dared to go beyond the typical fare. 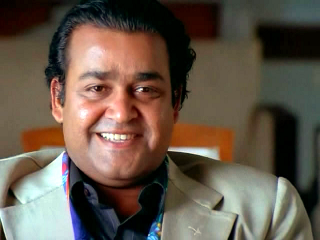 Both Mohanlal and Prakash Raj were brilliant in the film. Though all the scenes have been discussed one that really blew my mind was the climax of the film where Tamizhchelvan recites a poem in memory of his friend turned foe Anandan. 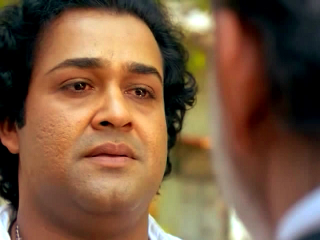 The emotions showed by Prakash Raj are just brilliant. I have watched this particular scene (and also when Anandan is shown his power by Tamizhchelvan) more than 100 times by now and i still don’t get bored. Iruvar was a brave film, notwithstanding the political consequences of tackling such stalwarts in a film, the sheer scope and extent of the film was aweinspiring. knowing very well that the film wa a huge risk, Ratnam made it with a gusto he seems to have lost of late. Guru, another thinly veiled biopic by the maker was not a patch on this one, with Ratnam playing pretty safe with the narrative in the latter. The music of Iruvar is my personal fav, a masterstroke by the mozart of madras ! That “gusto” you speak of is lost largely because of where recent Ratnam films have been born. By that I mean Ratnam’s best works started with a story, and then he cast actors, recruited crew who were suitable for the written words. But with GURU and RAAVANAN/RAAVAN, the projects started with the stars’ dates. And then came a story fashioned around them. Hopefully, his next film KADAL, starring relative newbies will revive the old Mani sir. totally agree! somehow the star culture seems to have caught hold of the master craftsman- a pity! hope he gets back to making stars out of scripts and not films out of stars! Guess, I’m striking a false note by confessing that the movie just did not work for me. I will be honest – didn’t share any of these emotions when I saw the film. I take it that technologically and in terms of its music, the movie was in a different league but as a script, it never talked to me. For starters, I’m not sure whether the movie was a documentary or a full-fledged movie – it only pretends to talk about the Dravidian movement and its politics but I don’t think you actually figure out anything more about the movement. For a movie that talks about the most prominent political leader(s) of the Dravidian movement and Tamil Nadu, it merely skims on the politics of the time and instead focusses on the individuals and so there are moments in the movie that are memorable but as a whole, it never got me into its groove. Was it a political movie or a biopic or a collage of the scene in the 60s and 70s as the Dravidian movement grew? Maybe Mani isn’t entirely sure. It draws comparison to actors/characters of that era but does not get you to understand the volatility of the movement that threw the Congress out and carved out a distinct Tamil Nationalist movement that still survives, albeit in a much blighted form. From a historical perspective, for example, there is a shot of M R Radha attempting to assassinate MGR but when it was depicted on the screen, I did not realise what was conveyed on the screen. Do we know anything about MGRs and Karunanidhi from the movie – it seemed to me a more stylized version of their lives, without getting me to understand any better what they stood for, their social and cultural backgrounds or the kind of politics that made them icons. Aishwarya’s presence as JJ was pretty fleeting and had no real relevance; the entire movie (keeping aside the technical side) makes me think of the kind of cinema that Mani represents – attempting to be intelligent but largely skimming on the surface with no real insights of the real dilemmas. ‘Was it political vendetta that forced them to do so, or a dumbed down audience more interested in the kind of political film where a man becomes Chief Minister for a day, jumps on buses and beats the living daylights out of goons, we may never know.’ – Granted that the audience may not appreciate cinema that attempts to break free from conventions but that’s a little condescending on an audience who does not think that the movie never meant anything to them and was a glorified but superficial image of two Dravidian icons. I’m extremely glad to see your perspective here. It’s not often one comes across such a critical view of IRUVAR. From your comments Pradeep, it looks to me like you were looking for a detailed and perhaps, objective political document in this film. And I wholesomely agree with you that Mani Ratnam waters down the politics and is guilty of over-simplifying it. The political dilemmas were certainly not explored in depth. But I also feel that is why the film connects with so many cinephiles. Exploration of character and emotion is far more interesting to watch in a narrative film than political discourse. On a script level, IRUVAR is never really intended to be that discourse. It really is a simple story of two best friends turning foes reaching a point of no return even if they want to call off the war. The references to real-life characters, the detailing of the scenes to match the time-periods and so on are frills that add the tadka to the emotional, character-driven daal Ratnam is cooking. A parallel that I would draw is Ron Howard’s film A BEAUTIFUL MIND, a film I quite liked. Imagine if the film focused on the specifics, the nitty-gritties of John Nash’s mathematical innovations instead of his schizophrenia, his relationship with his wife, and the struggle with his peers. Would the specifics of the math have made for as engaging a film as the exploration of emotion? I look at IRUVAR the same way. Character and drama trumps everything else. And as for your comment on my condescension, guilty as charged and unapologetic about it. I was not expecting a political discourse perse but this is a movie where the politics cannot be divorced from its form but Mani merely touches the political angle of it. It pretends to showcase the political moorings but is happy to have a gentle stab at it, at times a bit like the disappointing Merly Streep’s The Iron Lady. It starts off as a biopic and then moves to a naive rendering of the era, notwithstanding the sets and the brilliance of the performances. Rn Howard’s ‘A Beautiful Mind’ essentially was about Nash’s struggle against his illness, even though Sylvia Nash’s book has a slightly larger canvas. Here I don’t know whether Mani intended to be about Anandan or Iruvar or an ode to those times (I think the movie was initially called Anandan). Sometimes the narrative and music took over the dialogues rendering possibly powerful parts useless (maybe due to censor trouble). If it were largely a work of fiction, maybe he could have avoided the characters who have not much of a relevance in it and if it were to really be a historical, then the characters need to be fleshed out further, especially the female characters. Maybe I am imposing my view of what I intended to watch in the movie rather than what the director wanted to tell me. I’ll admit I am hooked to politics and its intrigue and missed it in this movie. I had the exact same reaction as you did to THE IRON LADY. I was looking for a political drama that went deep into exploring the political details of Thatcher’s term. I would have perhaps even looked beyond that had the drama been strong. A lone woman, suffering from dementia, battling old age inside a room didn’t make for very engaging viewing though. IRUVAR is certainly not a perfect film and has several flaws. On that note, I also agree with you on the female characters. It seemed a little convenient and pointless to kill off Kalpana. Perhaps that was intended as an excuse to claim that the film is a work of fiction. Revathy’s character is almost forgotten, and could have added an interesting dimension considering the part her real-life counterpart has played over the years in Karunanidhi’s rule. A film like Iruvar certainly deserves a tribute like this. Thoroughly enjoyed reading & re-reading this take Vijay. I’m sure that if Mani Sir had been given the liberty of some more bandwidth he could have focused a little more on exploring the political scenario and moved beyond the boundaries that exist right now in the film. I still remember my experience of watching it in theatre. This was a Pongal release in 1997 and along with it released the more ‘crowd friendly’ Minsara Kanavu by Rajiv Menon. Went to watch the film @ Ganga ( Part of the 3 screen cineplex-Karpagam Cinemas @ Coimbatore ) on the 2nd day of release and saw hardly any crowd at the counter. Whereas there was a huge crowd in front of the counter @ Kaveri which was playing Minsara Kanavu. It was heartbreaking to watch such a magnificent film with a very poor turnout on the very 2nd day of the release. The public in fact had rejected the film outright-this has to be Mani Sir’s biggest commercial failure. At least while Dil Se flopped the Tamil version Uyire did fairly well and while Raavan flopped Raavanan did fairly well. But as years pass our respect for this film only continues to grow. I’m hoping to see some old magic once again with Kadal lets see how things turn out. After having a re-visit today I clearly felt that this movie was never intended to be about politics, but about two personalities and their lows and rise to achieve that iconic status. Politics is just merely a tool which is used in the backdrop and in no way was required to get in the details of it. It’s just pure human emotions between 2 friends and if not for the MGR/Karunanidhi angle, still makes for compelling cinema. The last few moments especially when Tamizhselvan comes to Anandan’s house and have to leave without being able to view Anandan due to security risk is a great moment of Indian cinema… It’s just painful to see Prakash Raj hamming his way to glory nowadays and I am still waiting for Mohanlal to return to his old self. I really wish Mani Ratnam would re-release his old films the way Vinod Chopra recently did with his body of work. I would give an arm and a leg for a chance to watch IRUVAR off a 35mm print. Yes the DVD transfer is quite pathetic, specifically in the Black & White portions of the film, many of which show up with a blue tinge. Even though Mani Ratnam did not get into the specific details and nitty gritties of the politics too much, I never really felt it was necessary. I remember watching this film for the first time as a high-school student living in Japan in 1997 on VHS. I was absolutely clueless about Tamil Nadu politics and in fact, on my first viewing of the film, was clueless about all the real life references. It was solely the craft and drama and characters that blew my mind. I then ran to my father and insisted that he watch the film with me. It was only on my second viewing with him that he explained that it was based on a real-life story, and explained every single reference that was made to MGR, Karunanidhi and Jayalalithaa. The reason I bring this up is to explain how strong the film is on drama and character and why the nitty gritties of the politics wasnt even necessary. Well I guess the title itself being ‘Iruvar’ i.e 2 individuals/people I do agree that Mani Sir’s focus more or less was on the 2 personalities i.e Anandan&Tamizhchelvan. And in that respect I certainly have no complaints. The setting of the 50’s,60’s,70’s & 80’s was almost so picture perfect. Apparently the whole idea struck Mani Sir over a discussion with the legendary M.T.Vasudevan Nair. All in all this is a movie that everyone associated with can proudly display in their filmography!!! Awesome debut Vijay. Need to watch Iruvar rightaway. And would love to comment in detail once I have watched it. Nevertheless, a brilliant debut by you. Iruvar is truly a masterpiece. One of the best films ever made in India. It is amazing how every single person associated with the film has done an astounding job. Santosh Sivan and Rahman are in top form. Also the scale of the film content-wise and also shooting-wise is mindboggling to say the least. Fantastic post! I am with you when you say the songs are so beautifully shot that you can’t help appreciate them too. Also I feel songs(other than Vennilave) do add little to the narrative. I think the choreographer of the film also deserves a lot of appreciation as he has covered a lot of different dance styles quite authentically. I agree that Iruvar is a fantastic movie and a grammar for Tamil film making. Music, BGM, cinematography, editing, direction and every single department in this movie did a fantastic job. But, I felt that there was a compromise made. As Karunanidhi is still alive and MGR is no more, I think Maniratnam has made Anandan’s character was shown to be more selfish than Tamizhchelvan’s. One of the lines in the song Aayirathil nann oruvan, ‘Indha ulagam kadhavadaithaal etti udhaippen’ is not MGR style of line.